Tocarra McBride began her professional writing career in 2000 when she began working for her local newspaper, the "Times Daily." Since then, she has written for various fitness and lifestyle websites and been promoted to managing editor at the "Times Daily." McBride holds a Master of Science in nursing as well as a Master of Science in nutrition. When turkey is served as a meal, it is usually the star attraction. The last thing you would want is your guests to chomp on a dry piece of this large bird. When a turkey is overcooked, it becomes dry and unappetizing and lacks any flavor. Slow cooking your turkey overnight is the best way to insure that it will be flavorful and brag-worthy. Decide whether you will cook the turkey overnight in a slow cooker, such as a Crock-Pot, or in the oven. Consider the size of the turkey and if it would fit in a slow cooker. If it will not, use a roasting pan or aluminum pan for oven cooking. Remove the turkey from the packaging and rinse under warm running water. Some turkeys will have giblets, or internal organs and other leftover parts, inside the cavity of the turkey. Remove these items before cooking. To do so, reach your hand into the open space where the turkey's head was. The giblets will be in a bag inside. You can discard these items or use for giblet gravy. Pour 1 cup chicken stock into the pan you will be cooking in. This will help prevent the turkey from burning on the bottom. Place the turkey into the pan, with the breast side facing down. By having the breast meat on the bottom, the seasonings will flow downward and help this part of the bird be moist and flavorful. Season the turkey. You can use anything you would like when it comes to seasoning a turkey. Some people use a marinade that can be injected, and others just rub the turkey down with a blend of spices. Place one stick of butter into the empty cavity of the turkey. This will help to add flavor to the breast meat. Cover the turkey with foil or a lid. If you are using a slow cooker, make sure that the lid fits and seals correctly. Turn on the stove or slow cooker. For a stove, you will cook the turkey at 200 degrees Fahrenheit for eight to 10 hours overnight. For a slow cooker, set the cooker on the "Low" setting and cook for 10 to 12 hours. 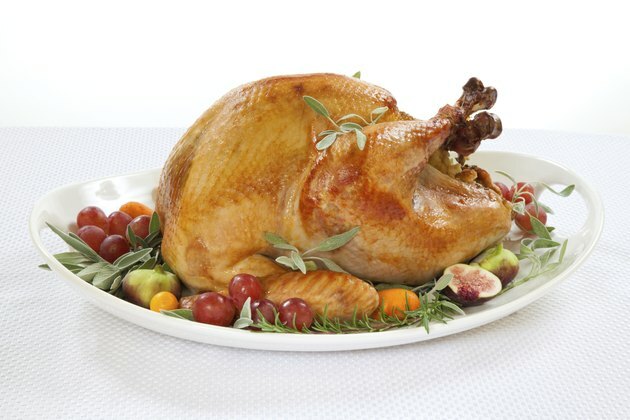 The cooking time will be based on the size of the turkey, because a larger bird will take more time to cook.